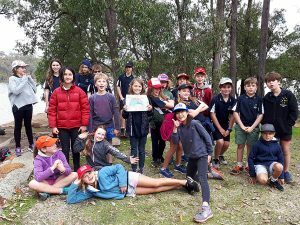 On Wednesday 23 August, Year 5 participated in the WA Schools Orienteering competition around Lake Leschenaultia. Susan B and Neil drove us for an hour and a half to get there (with no DVD!). Some of us ran as individuals, but most of us did it in pairs. The landscape was a bit muddy and there were a lot of trees and a very big lake we had to run around. But there were volunteers to help us if we got a bit lost. We all started at different times and had fun standing on the sidelines cheering on classmates when they came to the finish line. It was a fun day (well, maybe not so much the getting lost part). It was quite tiring and a long day… but it was only a warm up for those who did cross-country the next day.